And that lovely dark island is calling to me. What is it about Scotland that causes such a loyalty in the hearts of its sons and daughters? Is it the call of the pipes? Is it the beauty of the land? Is it the fact that so many Scots were forcibly kicked out of the country? Or is it just built into our Scottish genes? My ancestry is the average USA mix of various western European nations, yet I don’t belong to the Bakersfield English Society or the Dutch Heritage Hall…these societies don’t exist. 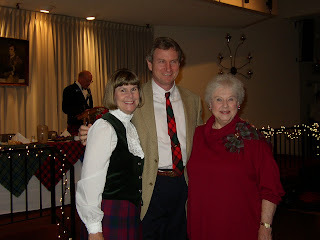 But come most Januaries and we proudly don our Lindsay and Kerr tartans and pay tribute to Rabbie Burns at the Kern County Scottish Society's annual dinner. land o' my hearrrt forrreverrr...Scotland the Brrrave! For these are my mountains, And I'm going home. As always, the first two days blend together into one long day of traveling. Unfortunately, I got my mysterious “travel disease” that struck two years ago on the way to Sweden (and would strike again on a later trip to Italy!) and was terribly sick off and on throughout the trip, but other than that, the journey was smooth. I think we spent more time waiting in airports than we actually did flying, but the flights themselves were easy. We met a nice Armenian girl, an exchange student just returning home, who shared our flight from Bakersfield to LAX and then on to London. Rob and I both actually slept on the flight from LA to London (unusual for us!) And the rest of the time was spent reading the fascinating story of Mary, Queen of Scots, so the trip was quite tolerable. The only snag in the whole trip occurred when our London to Edinburgh flight was delayed about 1 ½ hours, but I actually slept a bit more in Heathrow. 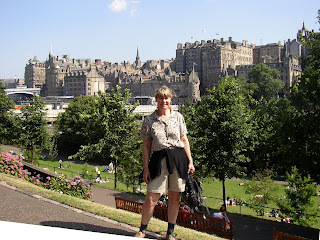 Then a short flight to Edinburgh, a bus ride to Waverly Station, and we had arrived! We checked into our hotel – the Adria Hotel on Royal Terrace – at about 8 p.m. The Adria is lovely – a small hotel in a row of nicely maintained Georgian buildings at the back of Calton Hill. Edward, the owner, was very sweet and helpful. He provided us with a map and guidebook and recommended restaurants nearby. We cleaned up a bit, had a “so-so” Chinese buffet and took a short walk, then went to bed and slept soundly until morning. Our Second Anniversary! We woke to our 7:15 a.m. alarm, but both of us went back to sleep for a while. Thank goodness, I woke up feeling MUCH better than I had on the trip! 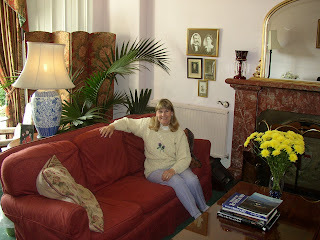 We were provided a wonderful, full breakfast at our hotel, then set off to explore the city. 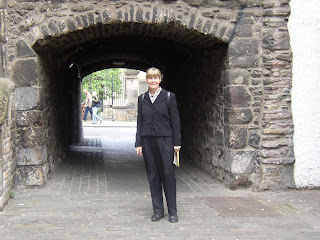 We headed first to Holyrood Palace, which I was very excited about seeing, as I was in the middle of reading the aforementioned fictionalized biography of Mary, Queen of Scots, but to our surprise, Holyrood was closed in preparation for the Queen’s visit tomorrow! 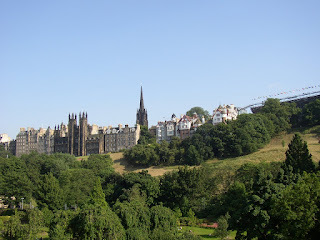 Happily, we return to Edinburgh at the end of our stay, so I planned to see it then. We also visited John Knox’s house and St. Giles Cathedral where he preached (which was also especially fascinating in light of what I am learning about his hostile relationship with Mary – what an incredible story!) Then we stopped at a café for a cup of tea and bought our first Scottish items. I got a Lindsay hat and was so happy to find a Lindsay crest to hang on our wall at home next to the Kerr Shield that we already have. Rob found a Kerr scarf for his brother, Jeff. 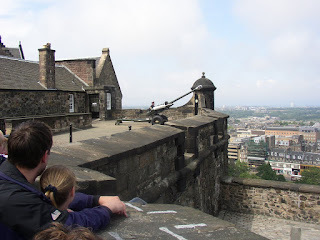 We continued up the hill to Edinburgh Castle where we were just in time to witness the firing of the one o’clock cannon and see the time ball drop on Nelson’s Monument across the way on Calton Hill. The views of the city from the Castle are beautiful. 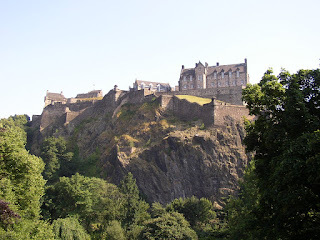 Edinburgh is a very distinctive city…the old medieval portion extends along the spine of an ancient volcanic ridge, with Holyrood Palace at the foot and Edinburgh Castle at the top. 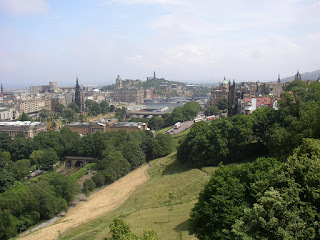 Below the Royal Mile is a “valley” separating this old section from the “new” part of Edinburgh, where Princes Street shops line up overlooking the valley from the other side. I remembered the unusual layout of the city well from my brief trip here in 1970 (33 years ago! ), but I have learned so much more history in the years since my first visit that it made an even greater impression this time. 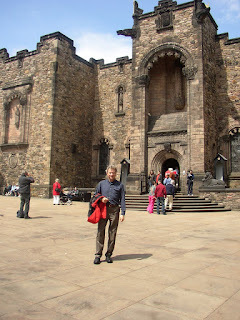 We wandered the Castle grounds for awhile, visiting the Queen’s Chamber, where Mary gave birth to James VI (James I of England), and saw the Crown Jewels, the “Honours”, and the Stone of Destiny, which was just returned to Scotland by the English in 1997. Somehow we missed the Great Hall, but we were getting hungry, so we headed back down to Cockburn Street where Rob found a restaurant he remembered and liked from his previous visit here a few years ago. It specialized in baked potatoes with all kinds of different stuffings – very good! As we ate, we had a nice chat with a couple of young ladies from Australia. We were still a bit jet-lagged so we gave our feet a rest by taking the city tour on the HO-HO bus (hop on-hop off) – and saw some lovely corners of the city that we would otherwise have missed. I was struck by how many corners of the city look near as they must have looked for hundreds of years! Then we returned to the hotel for a rest before meeting James White and his family for dinner this evening. (James was the Scottish exchange student who lived with my family when Brian and Libby were still in high school.) I’m now sitting in the very attractive lounge of our hotel writing while Rob naps. Everyone got on splendidly and the evening passed much too quickly. It started to rain (after threatening to all day) as we returned to the car, and I reluctantly said good-bye, but we hoped to see James in Glasgow at the end of our trip. After everyone had driven away, I realized, much to my dismay, that we had forgotten to take any pictures! 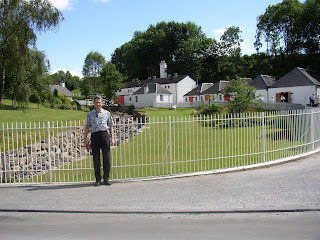 Very sadly, this visit would be the last time we ever saw James, who very tragically passed away in October, 2006. Today we saw a special exhibit in the Royal Library of journal entries and letters by various travelers throughout the ages about their reactions to and impressions of Scotland. (My favorite – “When they’re not fighting wars, they are fighting with each other.” Oh, that Scottish stubbornness and temper! My own family and Rob’s have a wee bit of that trait, as well!) I count myself lucky to be among the numbers of those travelers, and I now see why they wrote so small…at the rate I’m going, I’ll fill this journal before the end of the journey! I want to remember every moment, but if I don’t record it, each moment seems to fade so fast! Let’s back up…we woke up around 8 and had another great hotel breakfast. During breakfast, another guest – a Presbyterian minister from Fort Worth, TX - overheard me mention St. Giles Cathedral (from my readings about Mary) and informed me that the Fort Worth choir would be performing there at noon so we put it on our calendar for the day. 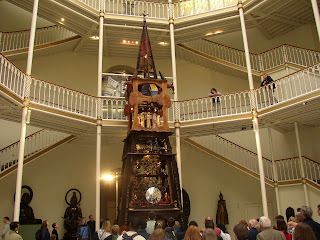 It had begun to rain in earnest, so we canceled our hike up Arthur’s Seat and headed up to the National Gallery which had a good collection of art – Scottish and otherwise, (some nice Rembrandts), although it was not quite on a par with some of the other museums we have visited in our travels. 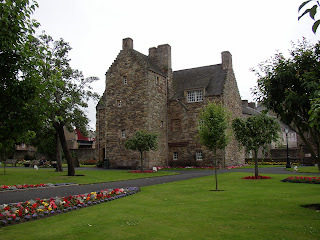 Then we made a brief stop at the Writers’ Museum, which held artifacts and belongings of Robbie Burns, Sir Walter Scott, and Robert Louis Stevenson, as well as a special exhibit on John Muir. 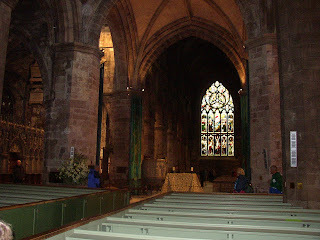 At noon, we made it to St. Giles Cathedral just in time to hear the Fort Worth choir, which was very good. The church was very impressive. I could actively picture John Knox railing against poor Mary from his pulpit. 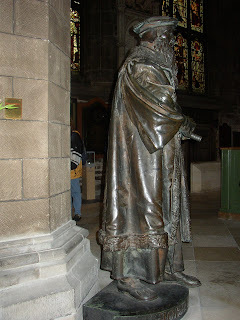 His statue stands near the front of the church. Following the concert, we had a nice lunch at the old Deacon Brodie restaurant, visiting with a lovely older couple from Kent. Deacon Brodie was the real-life inspiration for Dr. Jekyll and Mr. Hyde! 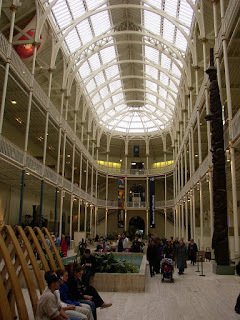 It continued raining hard, so we headed down to the Museum of Scotland, which turned out to be wonderful – incredible artifacts from the stone age forward, laid out and labeled clearly. I found the area devoted to the two areas of Scottish history that would form the two major themes of our trip: the reign of Mary, Queen of Scots, including a replica of Mary’s coffin, and the museum section devoted to the Jacobite rebellion, which included Bonnie Prince Charlie’s solid silver canteen and gold mess kit. The Museum is connected to the National Museum, which is huge and beautiful, but we didn’t get to see it as the Queen's visit got in the way again! Apparently, she was arriving for a special event that evening, so we got kicked out at 2:00. 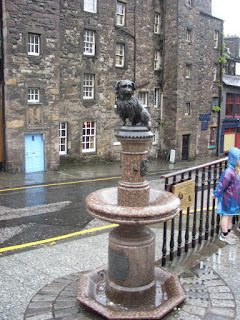 By happy fortune, we were directly across from the little statue of Greyfriar’s Bobby, the little Skye terrier who became famous by refusing to leave his master’s gravesite. The people of Edinburgh trained him to come for his feeding at the firing of the One O’Clock cannon, and the city itself paid for his license when there was no one else to do it. Although it was very grey and drizzly, we wandered around the Greyfriar’s cemetery for a while and suddenly I saw a sight that made me jump. 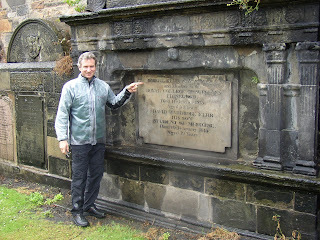 There on a large gravestone embedded in the wall was engraved the name Robert Kerr! I excitedly called Rob over to see his own grave. It was quite an eerie feeling. This Robert Kerr had been a doctor in Edinburgh who had died in 1813. We were still a bit jet lagged and exhausted, but we stopped for dinner at the Abbotsford restaurant where we had a good British meal of Yorkshire pudding for Rob and steak and ale pie for me. The meal revived us considerably, so we stopped by the very nice Internet café where we wrote letters home, then had one of the nicest moments of the day. 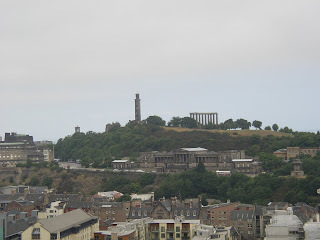 The sun (still fairly high in the sky in these northern latitudes) was finally peeking through the thick grey clouds, so we headed for the top of Calton Hill. We could not have timed it any better. 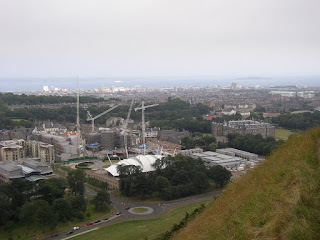 The clouds broke and we had spectacular views of the 360o panorama of the Firth o’ Forth, Edinburgh city from the Castle on the hill down to Holyrood Palace, Arthur’s Seat…the ancient volcanic peak that stands behind the city. The top of the hill itself contained a replica of the Parthenon and the Nelson Monument. Everything was bathed in a beautiful golden glow. What a wonderful end to our first stay in Edinburgh. We were still having a bit of trouble waking up. The alarm roused us from a sound sleep, but we made ourselves get up, as we had an appointment to pick up our rental car. We took the 26 bus to Haymarket Street where our car, a little grey Renault, was waiting for us. We then began the new adventure of driving on the left. Rob did a great job! I acted as navigator for the trip, with a map clutched in my lap every mile of the way and between his good driving and my “Turn HERE” on the numerous roundabouts, we had a happily uneventful drive. There were only two times we had to backtrack. (The roundabouts did get a bit confusing. They were actually well-marked…I just didn’t always see the place names that I expected to see. 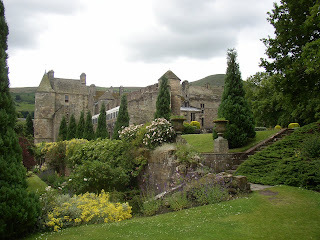 Our first stop was Falkland – an unexpected surprise AND treat, with a beautifully restored castle, the favorite hunting lodge of the Stewarts and the place where James V (Mary, Queen of Scots’ father) had died. 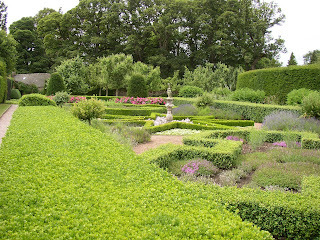 The castle contained many original portraits of the Stewarts, beautiful grounds, and the oldest tennis court in Britain. We took a tour of the castle and had a delightful conversation about Mary with one of the docents, a darling little old lady who told us that we had restored her good feelings about Americans. There had been a party of American bankers there the night before. They had just taken over the place, laughing at their costumed hosts, drinking in the chapel. Our hostess showed one of them a beautiful gold Russian icon of Mary and Jesus, and the woman asked, “Who are they?” Very sad. The little town of Falkland was charming, as well. We had a delicious lunch in the tavern. (I had a very interesting brie and red currant panini.) 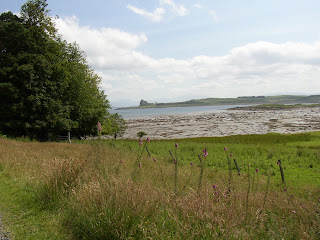 Then we headed off again, driving past Loch Leven, where Mary had been held prisoner and escaped with the help of her supporters, all the Fife fishing villages, and soon arrived at our next stop, the famous golfing mecca, St. Andrews. Wow! What a place! 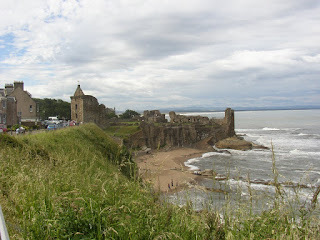 More Mary history…(I was tracing her journey all throughout this trip)…and the ruins of both the castle and the cathedral sitting right on the cliffs above the crashing waves. There is not much left of the castle, but what is left is very impressive. And the cathedral ruins were amazing! 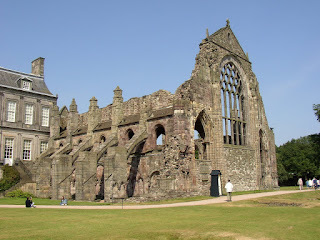 The front entrance and most of the back wall remain, but the sides are gone entirely, with only the huge round blocks of stone showing where the massive columns once held up the roof. The distance between the front and back was immense, so it must have been a huge, imposing building once upon a time. Both sites became an important part of the story of the struggle between the Catholic Church and the Reformers – so much history here! 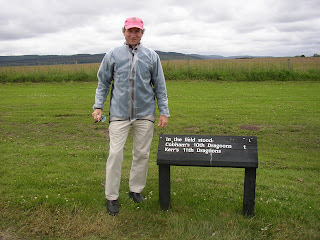 This was one of those magical spots where I truly felt the ghosts of the past – the same feeling I had on my first visit to Culloden battlefield back in 1970. We had a cup of tea then set out on the last leg of our journey to Pitlochry. It was a lovely drive that just got prettier and greener as we rose from the lush agricultural lowlands into the forested hills. 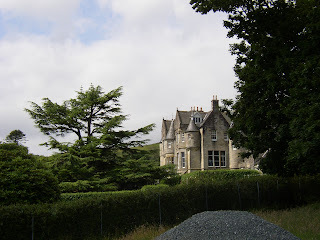 We arrived in Pitlochry about 5:30 and easily found our bed and breakfast, Craigroyston House. 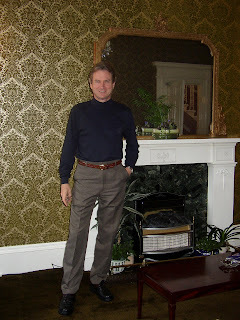 Douglas Maxwell, our host, greeted us very cheerily and showed us to our pink and green Victorian Room. 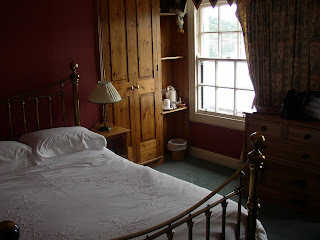 It was charming, with a canopied bed and antique wardrobe. The house itself was grey stone with beautiful terraced gardens overlooking the little grey town below. Rob and I rested briefly, then set out on a short walk along the river to the salmon fishery and the dam. 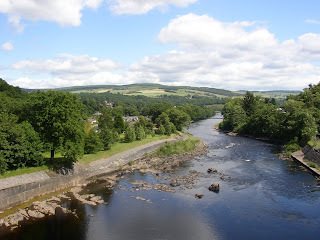 The sun had been shining through the scattered clouds ever since leaving St. Andrews, and the views of the town, The Tummel River, and green hills were absolutely gorgeous. We ended our walk at the Old Armoury, a darling cottage containing the best restaurant in town. Enjoyed a truly divine dinner (roast lamb for me and roast chicken for Rob) our in the garden, then moved inside for lemon tart and tea. Another absolutely great day…! …Followed by yet another glorious day! 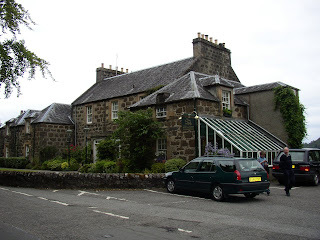 We got to sleep in a bit longer than usual, as it was a “non-travel” day, and went down for the Craigroyston House “Full Scottish Breakfast”…black sausage, eggs, sliced tomato, oatmeal, juice. 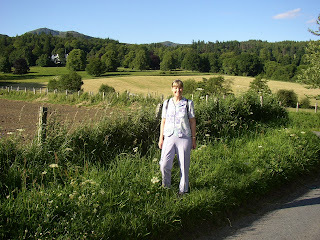 Then we set off on the first of our wonderful “Pitlochry Walks.” (The town provides a map with about 6 recommended walking tours.) 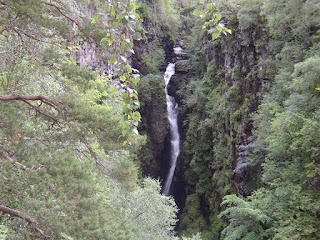 We first climbed to the Atholl Palace Hotel – which does indeed look like a palace – then dropped down into the Black Spout Woods. 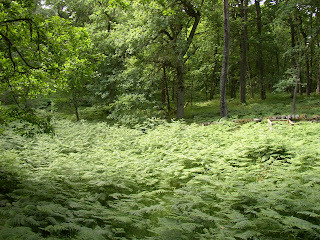 It was the most beautiful forest – lush green, carpeted with ferns, full of oaks and other trees, alive with the twittering of song birds. We came upon the Black Spout…a very high waterfall tumbling down several tiers of rocks into a stack of pools along the way into a glen far below us. 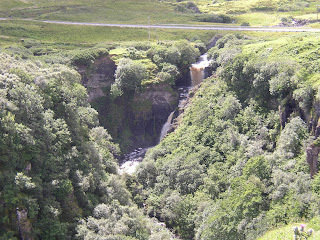 It rivaled any waterfall in Hawai’i for beauty! We continued our walk through the gorgeous green hills above the town to the Edradour Distillery, the smallest whisky distillery in Scotland. They are proud that they manufacture only as much whisky in a year as most modern distilleries put out in a week…saying that theirs is still made the traditional way and only a rare few of us get to try it. We took their very interesting tour, learning about the angels’ portion (the whisky that evaporates during the process…and, of course, had a “wee dram” forced upon us, in spite of our usual abstinence. Our guide just couldn’t imagine that we would refuse it! 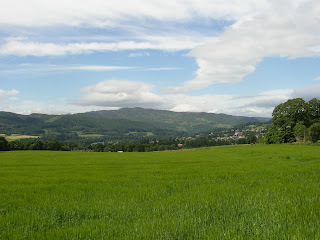 Next we headed up the hill to the stunning views of the hillsides and glens – high, bare crags looming up on our right, forested lowland hills on the left, and the Tummel Valley and Pilochry laid out at our feet. The weather was perfect all day… bright blue skies, a few drifting clouds, warm but with cooling breezes. We returned to town for a nice lunch at the “Old Smithy,” (mushroom pasta for me and steak-and-ale pie for Rob), then Rob returned to our room for a nap while I wandered the town to take more photos, pausing for a nice chat with a Dutch woman along the way. I also made a stop at “Heathergems,” the local factory that manufactures jewelry made from the dyed and pressed stems of heather. It was quite a fascinating process, and I thought the jewelry was unique and pretty so I purchased a few items for some of the ladies in our family, then just strolled through the town, popping in and out of shops that looked interesting. There were “Scottish” tourist items everywhere…from beautiful full kilt outfits to silly plaid berets with wild red hair poking out. I resisted buying anything except a few postcards – this round anyway. 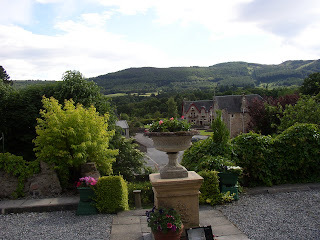 The entire stay in Pitlochry was actually an unexpected highlight of our trip. We knew nothing about the area…I had never even heard of it and just come across the town while doing research on good places to stay on our way north. But it turned out to be a charming spot…the small town of grey granite buildings nestled in the rolling green hills, surrounded by those lush woods. The town is renowned in Scotland as a theater mecca, with an annual theater festival, although we were not there at theater season. 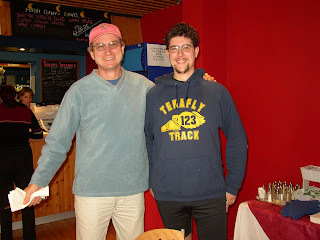 Rob and I met up again at 5:00 and went to Victoria’s Café for a “spot of tea” and scones. Then we set off up the East Moulin Road for our second splendid walk of the day. Even though it was already about 6:00 p.m., the sky was still full daylight and the air was still warm and delightful. 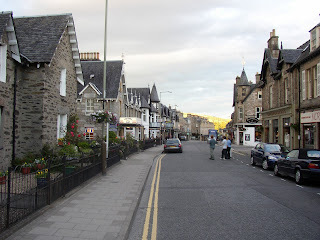 This time we walked past the residential area of Pitlochry and were struck by how well groomed and charming the villages are compared to many small American towns we’ve seen. 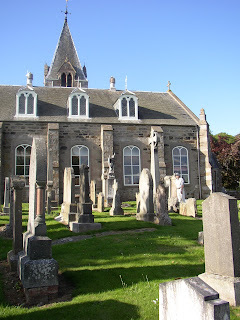 We arrived in the town of Moulin, which sits on the hill above Pitlochry (and was a Pictish village in the distant past), and visited the ancient church and graveyard of a 12th century knight. We continued on through more gorgeous views of the countryside, including the ruins of Caisteal Dubh, the Black Castle, which had been burned down by the local people (with all the residents still inside!) many centuries ago when it was discovered that a messenger had arrived at the castle carrying the plague! 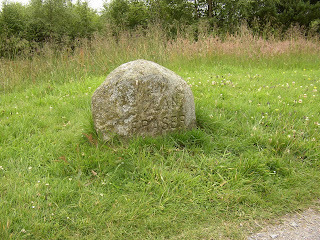 We also found "The Dane's Stone," one of the standing stones that are scattered throughout the British Isles. 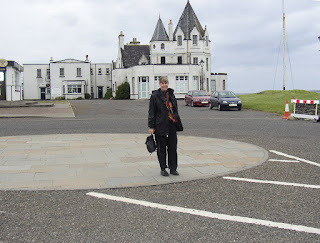 We returned to Victoria’s for a light dinner, and finally returned to Craigroyston House, sat in the lobbyy for awhile to write a few postcards, read a bit, and headed off to bed. A wonderful day! Friday, July 4 – Happy Fourth of July! 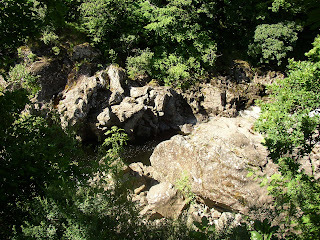 Next, it was just another mile to the site of the 1689 Battle of Killiecrankie, the spot where the early Jacobites defeated the English, and where their leader, John Graham, Earl of Claverhouse – but better known as Bonnie Dundee - was mortally wounded. 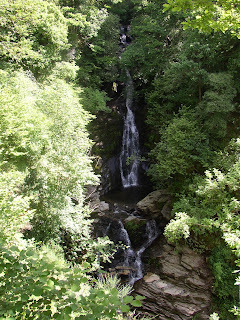 It was hard to imagine a battle taking place in that beautiful, peaceful spot…and even harder to imagine how they could have fought effectively on the steep and heavily wooded slopes of the gorge of Killiecrankie! It must have been something – a fierce, fast battle. The picture above shows the well-known “Soldier’s Leap,” where one of the redcoat soldiers leaped (successfully) across the gorge – 18 feet to the rocky cliffs on the other side! 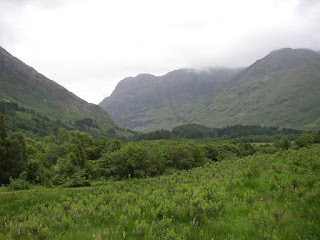 The Highland warriors who were pursuing him were so impressed that they applauded and let him escape into the woods. While there, we had a chat with an elderly couple from Norway. The weather continued to favor us with blue skies and perfect temperatures. It could not have been any more beautiful. 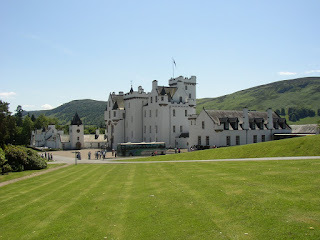 We continued on up the road about four miles to the Blair Atholl Castle, a large and beautifully maintained white “baronial style” castle that was used and lived in by the Dukes of Atholl right up until this last generation, when the 11th Duke provided it as a tourist spot. 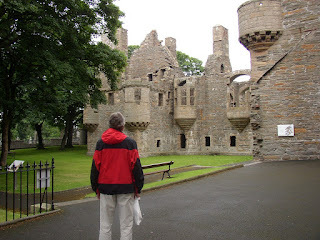 It was a much larger and well-furnished castle that the others we had seen. I could actually imagine living in this one. Queen Victoria visited here for three weeks in the 1860’s and was so pleased with her visit that she awarded the Duke with the right to his own private army – and this remains the only private army in Europe. A piper was playing outside the castle as we arrived. 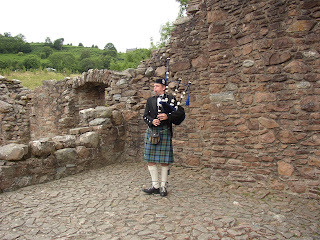 We have heard the pipers here and there several places on our travels around the country. We wandered the beautiful grounds for awhile. 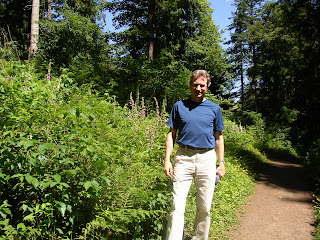 One of the Dukes had planted hundreds of conifers – including redwoods from California – so the forest was thick and lush, and full of birds who seemed quite unconcerned by our presence, apparently used to visitors. We walked up to St. Bride Kirk, an ancient churchyard filled with grave slabs so old that the writing was all but obliterated. 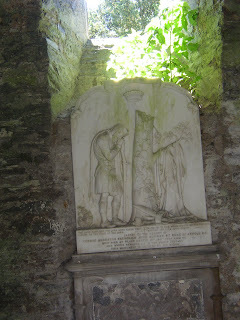 In the ruined church itself are buried the remains of Bonnie Dundee, who was carried to the sympathetic Blair Atholl Castle after receiving his fatal wound at Killiecrankie. 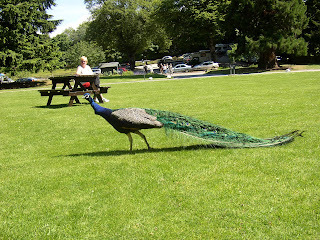 At one o’clock, again to the sounds of the piper, we returned to the car (stopping on the way to admire one of the peacocks who wander free on the grounds), and headed for Inverness. 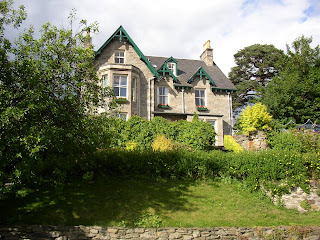 We reached Inverness at about 3:00 and, although the city driving with the crazy roundabouts was a little scary, found our way to our guesthouse, the Ballifeary House, with no problems. 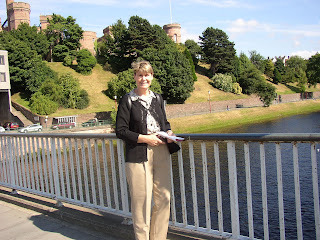 Our hostess, Morag, greeted us cheerfully and provided us with lots of information about the city. 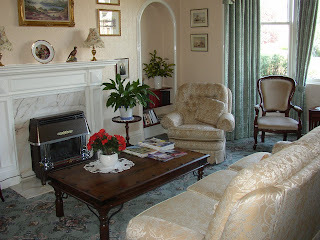 This is another beautiful (5 star) guest house, and – although the setting isn’t as charming as in Pitlochry, as this one is just on a residential street in a city – the house, garden, and living room – and our bedroom – are charming, and the location is idea…just one block up from the River Ness – and that means just one bridge away from downtown across the river. We rested briefly, then headed over to town to explore. 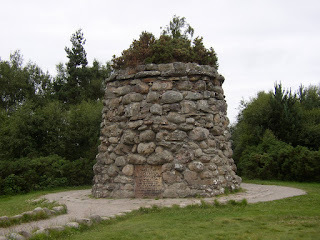 We found the location of the local bus tour to Culloden and walked up to the Castle – which is actually pretty modern, having been built in the mid to late 1800’s. It is now used as the Police Station. The castle is the only memory I have of Inverness from my visit 33 years ago and, sure enough, when we went around to the front, it was very much as I remembered, standing on top of the hill and the statue of Scottish national heroine, Flora McDonald, keeping watch for Bonnie Prince Charlie. During the walk, the wind came up very cold and the clouds moved in quickly, so I crossed my fingers for good weather the next day, but so far we had been very fortunate, so I determined not to grumble if we got a little rain. We had a busy day scheduled, so we got up around 7:30 and went down for another big Scottish breakfast. I had my usual porridge and Rob had his muesli, then I finally had the chance to sample Black Pudding. I can’t remember all the ingredients (although I do remember they sounded pretty disgusting)…but it was actually quite good – a kind of liver pate mixed with ground oatmeal. Our bus was one of the British double-deckers, so we had grand views of the scenery, although the weather remained very overcast and chilly. Our guide, Ishbell (Gaelic for Isabel) was very interesting and we learned a bit more about Inverness and Jacobite history along the way, including the very sad story of the aftermath of the Battle of Culloden. 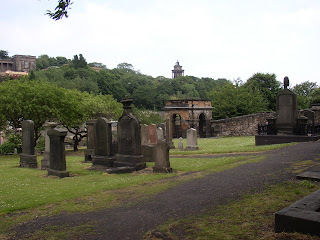 General “Butcher” Cumberland proclaimed, “No quarter shall be given,” and we passed a churchyard in Inverness where you can still see bulletholes in the gravestones behind which men, women, and children tried to take refuge while being slaughtered by the Hanoverian troops. 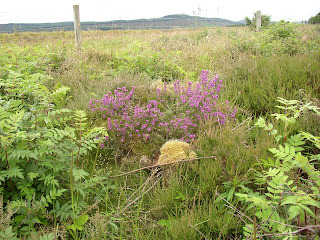 We arrived at Culloden and walked out along the heather-lined path (and along which Rob found the place where Kerr's Dragoons had stood). 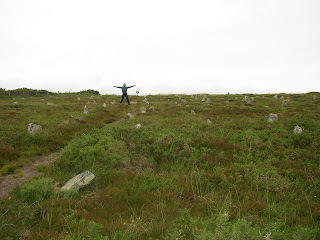 We passed by the gravestones marking the mounds of earth which covered the mass graves of each of the clans who fought there and on to the great cairn that stands as a monument to all of the fallen clans. 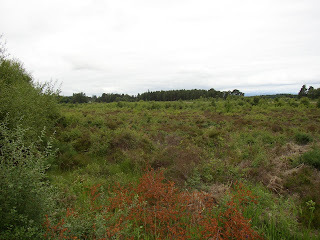 Culloden moor is now kept as it must have looked at the time of the battle. In fact, there is a herd of sheep that is moved from field to field to eat the shoots of new trees that would otherwise take over the area. This allows visitors to understand how difficult the fighting must have been…the ground is covered with little hillocks and scrubby, thorny little bushes and weeds in which the soldiers and Highlanders must have gotten tangled as they fought. This battle, which changed the course of Scottish history, lasted only about an hour and in that time, 1200 Highlanders and 350 Hanoverians were killed. And THEN began, as one of the books said, one of the most disgraceful periods of British history – the slaughter of the wounded Jacobites AND any Highlanders who had the misfortune to simply be in the area. 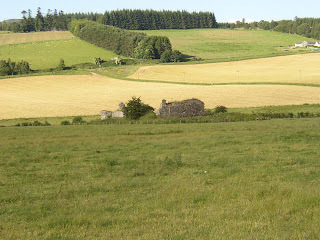 The historians have marked the location of the Red Barn, in which 30 wounded Jacobites were burned alive – an incident described in Dragonfly in Amber, the second of the Outlander series, the books that brought this period so much to life for me – and I paid special respects to the clan grave of the Frasers in appreciation for a very memorable fictional character, Jamie Fraser – and in honor of all of the misguided but determined men who fought here. 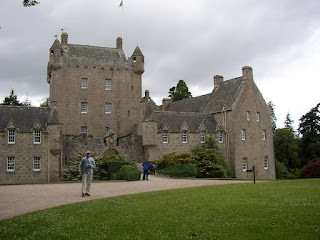 Rob and I caught the next bus and continued on to Cawdor Castle, which was never actually the home of Shakespear's MacBeth, the Thane of Cawdor, but which was another unexpected treat. It is a beautiful, typically medieval style castle – complete to drawbridge and square tower. 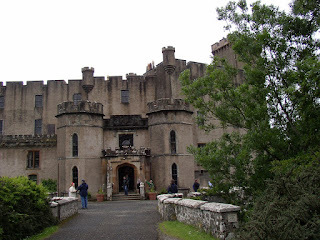 We took the self-guided tour and learned that the castle is actually lived in for half of the year by its current owner, the Countess of Cawdor, so the rooms are quite cozy and warm, with unexpected touches like a little carved Buddha and a book about the Dalai Lama, in addition to the usual four-poster beds and swords on the wall. Poor Rob, after “minding his head” on all the doorways of the castle, missed on the very last exit, and cracked his skull really hard. He was a bit dazed for a couple of hours afterward! 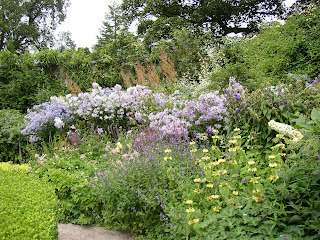 But we enjoyed the gardens of the castle which were especially wonderful – filled with gorgeous flowers in full bloom: roses, hollyhocks, climbing vines, and many more. On one side is a huge hedge maze which we didn’t have time to explore, and behind the castle are several miles of walking trails through the forests and meadows of the castle estate. We had a little lunch at the Castle cafeteria then caught the next bus back to Inverness, stopping by Fort George on the way. Fort George was built on the banks of the Moray Firth to help the British suppress any future Highland rebellions. From the bus, we also got our first glimpse of the shaggy Highland cattle, with their long bangs of hair falling down over their brows. 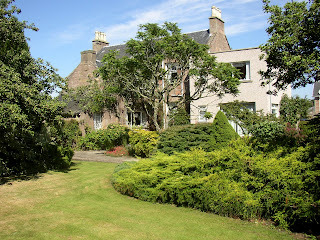 We got back to Inverness about 2:30 and returned to Ballifeary House for a brief rest before setting out for Loch Ness. For this journey, we took our rental car. It was very easy getting out of town to the south and within 10 minutes, we found ourselves driving along the banks of the Loch. 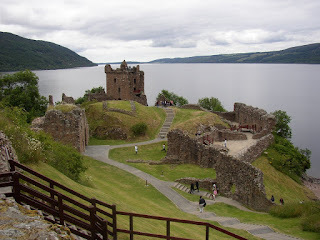 We arrived at Urquhart Castle in short order and had fun exploring the old ruins. This being a popular tourist destination, there was, of course, a piper to add a bit of atmosphere. 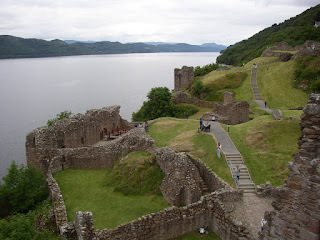 There isn’t much left of the old castle, but there are enough walls remaining– and, of course, the much photographed tower looming over Loch Ness – that you can easily see what an impressive place it must have been. It was last used by Hanoverian troops who, true to form, blew it up when they left to ensure that the Jacobites couldn’t use it themselves. 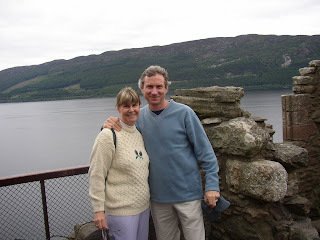 We climbed the tower and searched for Nessie, then returned to Inverness where we had a great dinner in the nice, airy sunroom of the Redcliffe Hotel. Rob had a bouillabaisse and I had a filet of sole – which turned out to be the entire fish laid out on my plate! Very good, but a new experience in eating. We have a nice chat with a friendly Scottish family, then headed home for bed. The evenings here are, of course, very long. It finally gets quite dark around midnight and is light again by 4:30 a.m. It’s very nice for our evening strolls but it also means I’m never quite ready to go to sleep when I should! We slept in a bit today…until almost 8:00, then had a lighter breakfast than usual and headed north for the Orkneys. Today was just a “traveling day,” but very pleasant, with lovely views of the coastline and countryside – and several interesting stops along the way (and a roll of the eyes from Rob who teases me about picking up the word "lovely" from the locals, who really do use it frequently). 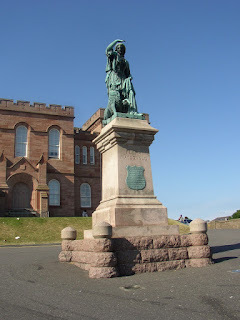 We had just a bit of trouble finding our way out of Inverness – the roundabouts weren’t as well marked as usual – but once we got set right, it was easy navigating all day. And, although the main highway is only one lane in each direction, there was very light Sunday traffic and plenty of “lay-bys” for passing or letting others pass, so it was a relatively easy drive for Rob. I had purchased a little book just before our trip called Best Loved Driving Tours of Scotland, and it turned out to be very useful, especially for a day like today when we were going through a region of Scotland not visited by many tourists, as it brought to our attention little highlights that we would otherwise have missed. 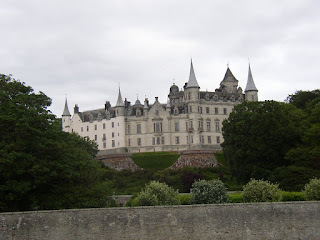 We made a short stop at Castle Dunrobin, the home of the Duke of Sutherland. (More about him in a minute.) The castle, sitting on a bluff over the sea, was very pretty Queen Victoria had called it a mix of a Scottish castle and a French chateau. We didn’t take the tour of the inside, but walked down to the beach in front of the castle for some nice views of the buildings. 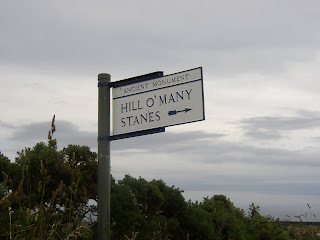 Then we continued up the coast, stopping for lunch in the tiny white village of Helmsdale, and stopping again at the “Hill o’ Many Stanes” – an ancient field of 22 rows of little standing stones arranged in the field by some ancient tribe. The scenery changed quite dramatically as we moved north. We left the lush wooded hillsides behind and spent most of the day driving through a low coastal plain. 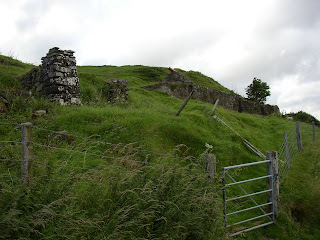 The landscape was marked by stone walls, plenty of sheep, and occasional deserted stone crofts – the little farmhouses deserted by the crofters when they were kicked out by the Duke of Sutherland, who evicted about 15,000 tenant farmers between 1810 and 1820. 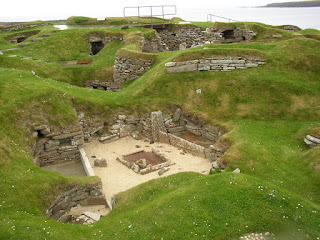 We made one last stop in Wick, an ancient Viking port, and paid a visit to the Caithness Glass Factory. Unfortunately, as it was Sunday, we couldn’t see the glassmakers working at their craft, but we enjoyed seeing the beautiful items in the giftshop. Then it was on the John o’Groats, the most northerly town of mainland Scotland… although not the most northerly spot. 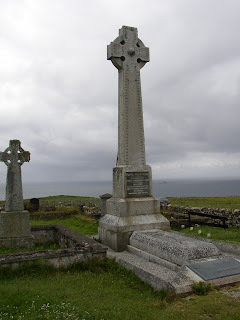 That honor belongs to nearby Dunnet Head. John o’Groats was a pretty touristy spot…mostly just a row of shops selling woolen hats and sweaters…but it was fun to see. We walked out to the cliffs to try to spot the puffins that nest there, but they were too far from our spot to make out. 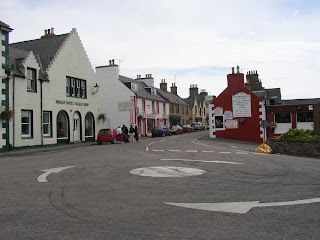 From this stop, it was just a short drive to the town of Thurso and its port of Scrabster where we were due to catch the ferry to the Orkney Islands. We were a couple of hours too early to catch the ferry, so we wandered around the deserted streets of Thurso. It was a drizzly Sunday, so we saw very few people. Rob had a snack of some fish and chips in a little shop that also sold a favorite Scottish treat…battered and deep-fried candy bars…disgusting! We had booked our passage on the Orkney ferry months before on the internet…and Rob was delighted to give his name and get waved on through. We drove onto the ferry, which was very modern and nice, and went up on deck, where we pulled away from the mainland in a dark rain. But about ten minutes into the trip, the clouds over the mainland parted and we rode all the way to the Orkneys right at the edge of the storm, with the sky behind us getting bluer and nicer all the time. 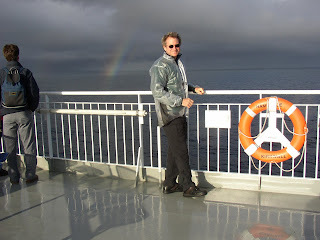 There were rainbows in the sky – lots of seabirds, including a couple of little gulls that sped along with our ferry, gliding along just above the water apparently taking advantage of the slip stream from our boat. By the time we came alongside Hoy, the first of the islands, the sun was shining brightly in the western sky and the gorgeous sandstone cliffs of the island were glowing gold and red. 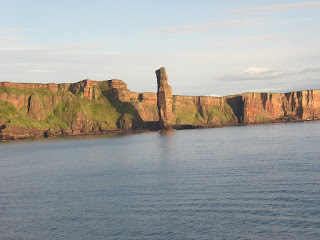 We got a great look at the “Old Man of Hoy,” a huge pillar of rock just off the coast, and soon we could spot the town of Stromness on the island of Mainland. Our ferry docked and we drove off and easily found our way to our final destination for the day, the Kirkwall Hotel in the capital city of Kirkwall. 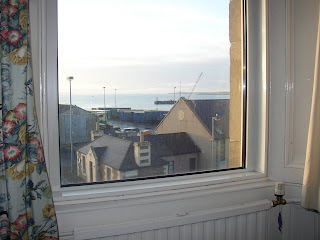 Our hotel room was a bit simple after the relative luxury of the last two places, but it was perfectly adequate and had a view of the docks from which the Orkney cattle are shipped to the mainland. Although we arrived at 9:30 p.m., the sun was still well up in the sky, so we took a stroll through town and found the main shopping street and the beautiful red St. Magnus Cathedral, which was glowing in the late evening light. I was pretty exhausted - it was the end of a long, long day - but Rob was still feeling a bit restless, so he took one more walk to talk to the cows waiting in the big ship containers down on the dock. The Scottish propensity for verse overtook him that evening and he wrote this meditative poem. It is midnight...the sun is not completely gone...there is a glow. 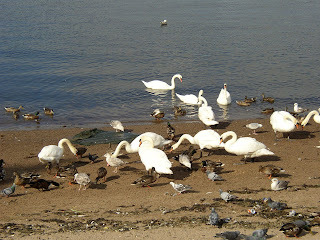 The ducks and swans are all huddled on the sand below. The ferry is snugly tied down and gently rocking. The ropes on the ferry speak softly. Things are beautiful even though I'm not getting anything done. Why does my mind push me to accomplish, when it has all been done? The ducks and the swans know. But the rain didn’t dampen our spirit of adventure as we set off for a day in the Stone Age…seeing all of the sights that make this place notable. 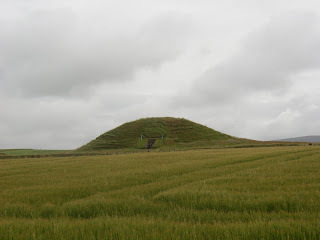 First stop was Maes Howe – a large burial cairn that was built before the time of the Pyramids. 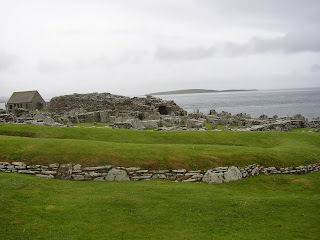 It had been broken into by the Vikings, so the roof had been restored, but the long, low entrance and most of the walls were completely intact. 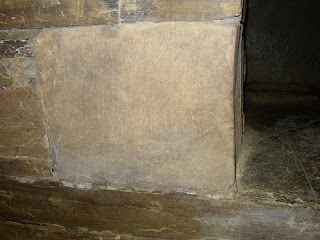 What actually makes Maes Howe so interesting in the runic graffiti that was left by the Vikings who uncovered it. They wrote nothing very profound…tidbits such as “Thorvald was here,” and “Ingeborg is a beautiful woman,” but it just covers the wall and is very well preserved. (It was kind of interesting to me how I found medieval graffiti to be so fascinating when I find modern graffiti to be so objectionable.) 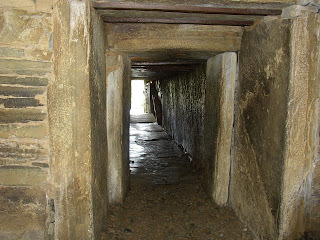 Just as in Newgrange in Ireland, the passageway into the inner burial chamber is built so that the rising sun on the winter solstice shines directly down the entry hall and illuminates the chamber. 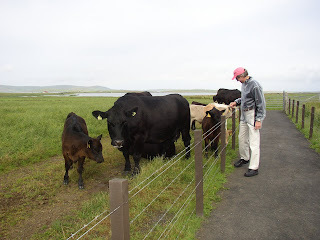 Rob and a nice chat with a cow that was grazing in the meadow along the path to Maes Howe, then we continued on to the Standing Stones of Steness. 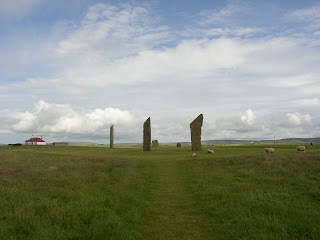 These are just three very tall, flat slabs rising out of the earth. This time we were joined by the sheep who graze in the field around the stones. 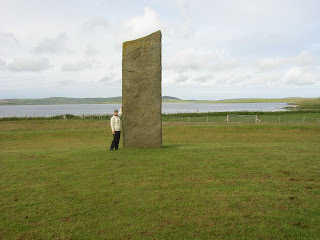 The amazing thing to me was that there are several other standing stones around the area that aren’t marked or labeled for tourists. There were two standing right in the front yard of a local farmhouse! 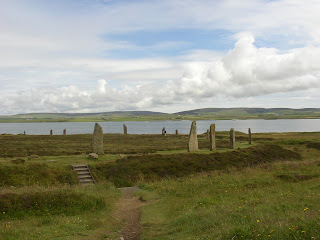 They just seem to be a normal part of the Orkney landscape. 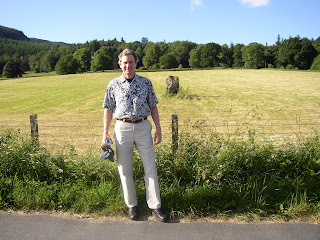 A short way down the road was the Ring of Brogdar, a perfect circle of 27 standing stones…all that is left of the original ring of 60 stones. 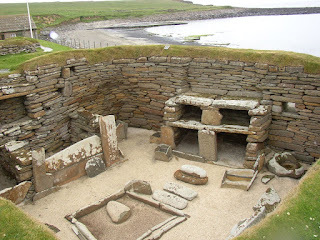 Next stop was the famous Skara Brae, a wonderfully preserved stone age village that had lain hidden in the sand for centuries and was uncovered by a big storm in the mid-1800’s. It was pretty amazing. I had heard about the place for years, and seen photos in magazines, but I didn’t realize that the furniture…all made of stone…was still in place there. Quite fascinating! It really did look like something out of the Flintstones, with bed frame, shelves, and everything else made of stone. There was a manor house (Skrail House) nearby and we took the tour of the house. The Scandinavian influence was very evident in the architecture. 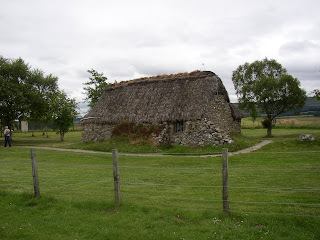 In fact, Mainland Island looked more “Viking” than modern Norway does because there are still so many places that retain the old style and the farmhouses are so remote. Following the visit to Skara Brae, we drove all the way to Birsay at the northern tip of the island and looked across the strait to the Pictish Brough of Birsay, with its outline of a Viking longhouse, but we couldn’t get across to see it because of the high tide. In low tide, you can walk out to the islet on a cement causeway which we could see faintly through the water. 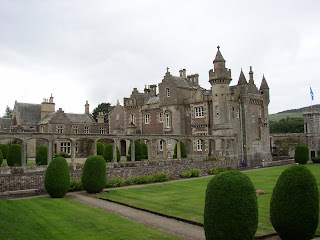 Nearby, we drove past the palace of Robert Stewart, half-brother to Mary, Queen of Scots. She bestowed Orkney and the Shetlands on him when she returned to Scotland from France, but unfortunately, he was a ruthless man who used his new power to badly oppress the Orkadians. The palace is now in ruins, but again, we could see that it had been very impressive in its day. It continued to rain quite hard off and on throughout the day, so our view of the countryside were a bit obscured, but we proceeded on around the east side of the island and got some fine views of the next island. 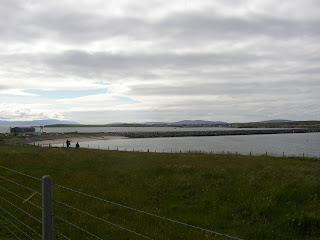 There are 70 islands in the Orkneys, so you often have other islands in view as you travel around the island. 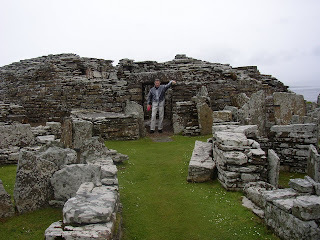 We made one more stop at the Brough of Durness, which was another large stone age community. We also explored the beach for “groatie buckies,” the local cowrie shell. We didn’t find any, but we did have a good chat with a local woman who figured out what we were doing before we ever said a word. We strike up conversations all the time – the people here are very friendly and happy to visit. Today was a nice laid-back kind of day. The weather was still overcast, but with quite a bit more sun breaking through from time to time. Rob finally succeeded in finding a place to get a haircut (a very good one! 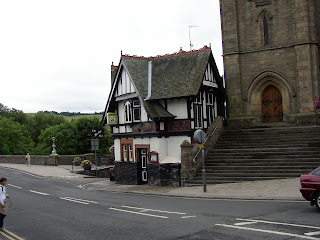 ), then we took care of some business, including changing our hotel reservations from Glasgow to Stirling. (We both agreed that we just had lost interest in visiting a big city.) After our little tasks, we explored the Earl’s Palace, a lovely ruined castle that had belonged to Patrick Stewart, the son of the Robert mentioned yesterday. Unfortunately, he continued his father’s evil ways and was eventually brought down by the other local lords – but he left a beautiful fairytale castle. 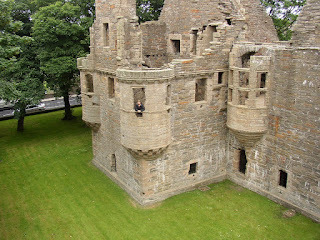 I felt like a medieval princess looking out of the little turret window. 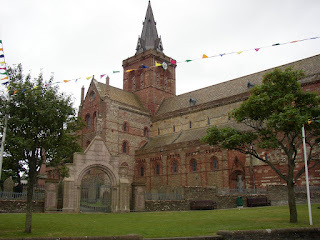 Like the beautiful St. Magnus Cathedral across the street, it was built of sandstone blocks, so some of the engravings and decorations on the stone were badly worn, but it was easy to see how elaborate it must have been in the 16th century! Following a light lunch, we split up for awhile to do some shopping in Kirkwall. Rob got a couple of nice prints for our travel wall, and I bought a beautiful gold pinkie ring with a Celtic knot design. 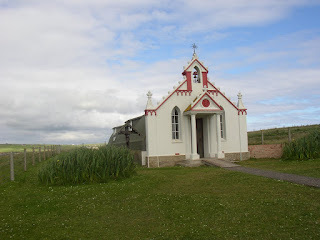 In the late afternoon, we drove down the southern tip of the island and saw the “barriers” put up by Churchill (well, not personally – but under his direction) to keep the German subs out of the Scapa Flow during World War II, and the pretty little chapel built out of a quonset hut by the Italian prisoners of war who were housed on the island. 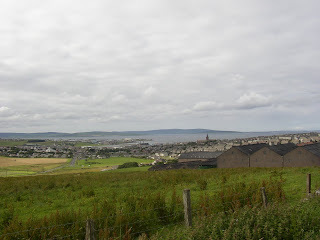 It was finally a sunny afternoon, so we drove up in the hills had some beautiful views of the town of Kirkwall and the green pastures of Mainland, as well as great views of many other islands – both near and far. We had another nice dinner at the hotel, including a visit with a computer expert from Aberdeen who was up here on business. 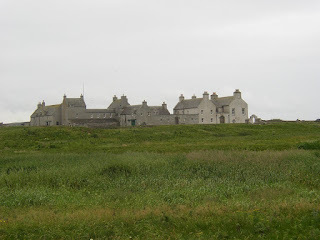 After dinner, we took a nice walk to some corners of Kirkwall we hadn’t yet seen, then returned to our room to pack for our next big traveling day. Our longest travel day. 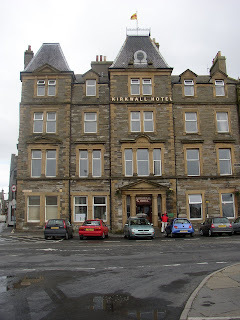 We left the Kirkwall Hotel plenty early to catch the ferry back to Scrabster. Wouldn’t you know…the clouds finally broke and the day was clear and warm…but it made for a very nice crossing. 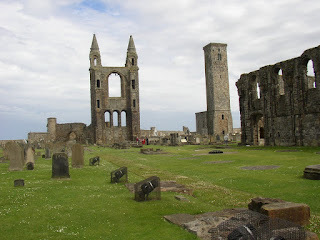 I had a nice visit with some elderly Scottish travelers, some former teachers, who saw my book about Mary and were delighted that I was so interested in the history. Our trip to Ullapool was only about 130 miles, but it took us five hours! First we drove across the top of Scotland to Tongue. We had lunch there, then set off through the Highlands down a one-lane road. It was pretty scenery – miles and miles of hills and dales – very barren and wind-swept, although not like the bare brown hills of the California desert. These hills were all covered with a short grass that made the landscape very green. But the going was very slow as poor Rob had to be constantly alert for on-coming cars and be ready to pull into the (thankfully numerous) lay-bys. Each time we passed another car (admittedly, a rare occurrence), the driver and Rob would exchange a little wave. (Rob proposed that they invent a little automatic hand that you could just pop up.) We were very impressed by the vast stretches of land where there seemed to be no people at all. Most of Scotland’s population is definitely centered in the cities to the south. 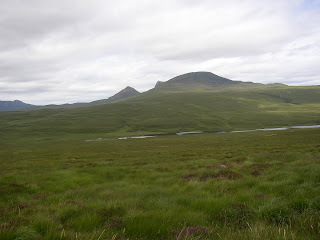 In Lairg, we turned west toward Ullapool. The landscape got more lush again. There were numerous re-forested areas and the mountains got higher and more dramatic looking. 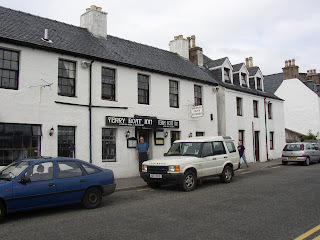 We finally dropped down into Ullapool, a little white town on the west coast and checked into our hotel, the Ferryboat Inn. 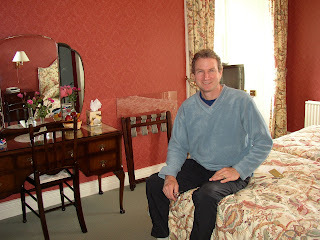 Our room was darling and cozy with wonderful views of the Loch Broom right across the street. We really enjoyed our short stay in Ullapool! We took a little walk along the waterfront and browsed in the little shops. We had a nice chat with a local, a displaced Yorkshireman named Mick, and a couple from Hawaii. Dinner was at the Seaforth Inn, then we set out on one of our evening rambles. 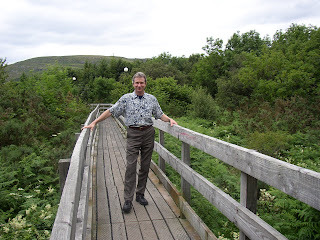 We found a nice walking trail that took us down a little gorge and across a bridge over a lush, fern-filled bog. Up the other side, in the residential area of Ullapool, we met another very pleasant man, a retired policeman out walking his two English spaniels. Rob, naturally, made friends with the dogs. The man told us about a local band that would be playing that evening at the Seaforth Inn, so we returned to the inn to enjoy the entertainment. We ran into Mick and the Hawaiian couple again…it turned out that Mick’s wife, Vivian, was a piper and was also playing that evening! 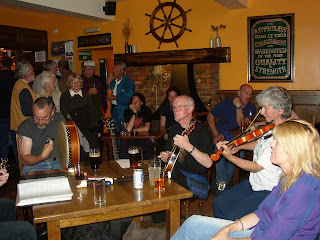 We had a great time…lively, foot-tapping music and fun of visiting with the local pub crowd. We took one more late evening stroll along the pier, where we marveled at the literally thousands of jellyfish swimming around in the water. We had seen a lot of them left on the rocks as the time went out earlier in our walk. 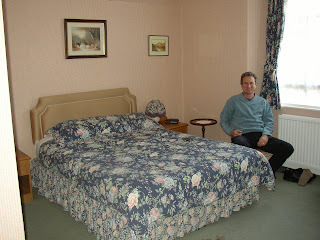 Then I had a great bath in the very attractively decorated bathroom at the hotel and we settled in for a good night’s sleep. 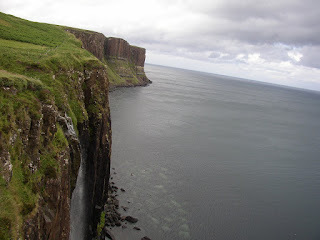 Isn’t there something romantic and wonderful about the name “Isle of Skye”? This was our next destination, but we had another fairly long day of travel to reach it. We set off early, but found the drive to be easier today as the road was two lanes. We made one quick stop to see the dramatic, deep Corrieshalloch Gorge that had been cut through the rocks during the end of the ice age and walked out over the (scary) suspension bridge where we got a great view of the very impressive Measach Waterfall below. 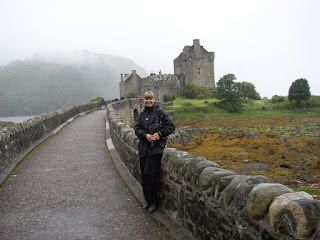 Then we continued on to Eilean Donan Castle, probably the most photographed spot in all Scotland. 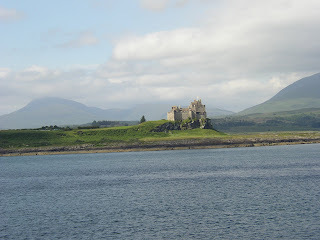 This was the castle used for the opening shots of the movie, Highlander, as well as numerous other films. Unfortunately, the weather was once again grey and drizzly, so our views of the spectacular scenery were quite obscured by rain and mist. 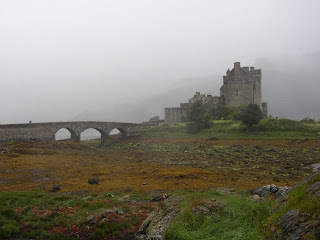 It was raining quite hard when we got to the castle, but it was still fun to see it, as we have a painting of it on our living room wall…and the setting is so pretty…a beautiful little castle sitting out on a tiny island and connected to the mainland by a lovely arched bridge. I was struck by how much the tides recede here. We arrived at low tide and the “island” was actually surrounded by seaweed covered rocks that would be covered by the sea again in a few hours. Then it was “over the sea to Skye” – although it was actually over the bridge to Skye, as a bridge now connects the island to the mainland. Poor Rob was getting really tired of driving by now, so it was a little discouraging to discover that our Bed and Breakfast was well toward the north end of this fairly large island. We stopped for lunch in Portree, the main town, and had an amazing little encounter. Sitting across the room was a young man wearing a Tenafly High School track team jersey! Rob naturally struck up a conversation, and it turned out that the shirt had just been given to the boy by a back-packer…but what an illustration of our small world! We continued on another one-lane road, past the many sheep who were grazing nearby, and finally reached the Glenview Bed and Breakfast. It was very nice – a little white cottage – but very remote. I had not realized when we booked it that we would be so far out in the country. 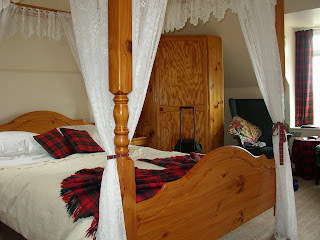 We had a cute little room with gabled ceiling – in fact, we had to be careful not to bump our heads in the corners – and the bed and chairs were decorated with the Kerr tartan! 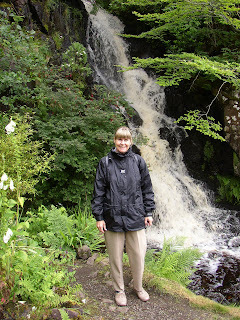 We did a little afternoon exploring and visited the nearby waterfall of Lealt, which was a raging torrent after all the rain, and the waterfall of Mealt, a misty fall into the ocean. Then we finished the day with a very good meal at our Bed & Breakfast (which also offered dinners due to its remote location), and enjoyed sitting in the cozy living room in front of a coal fire and visiting with some Canadian children who were also staying there. The castle building itself was not as impressive as some we had seen, but it did have some fascinating artifacts, including the Faery Flag…a VERY ancient and tattered, but carefully preserved), banner of silk that apparently had been brought back by an early family member from the Holy Land during the Crusades (but which family legend says was given to the family by the faeries). Clan members have always carried this banner into battle…and they actually carried photos of it into battle during World Wars I and II. There were also a variety of objects related to Flora McDonald and Bonnie Prince Charlie, including her locket containing a lock of his (very blond) hair. The gardens of the castle were particularly pretty, almost tropical, with several waterfalls and lush dense growth of huge elephant ears, ferns, and flowers. 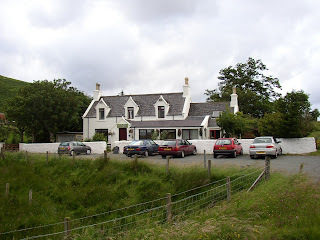 We had lunch in the village of Uig then continued on our loop around the Trotternish Peninsula. 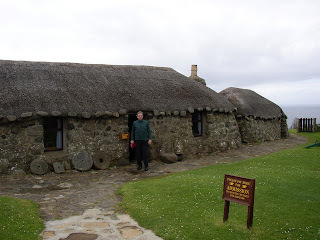 The next stop was a folk museum that included a variety of replicas of crofters’ homes. We had seen the ruins of these abandoned little stone cottages all throughout our travels through northern Scotland – in fact, there was one sitting on the hill just above our B & B on Skye – so it was quite fascinating so see how homey they could be inside, with wood sides on the inner walls and a canvas “ceiling”, pictures hanging on the walls, family objects neatly arranged. Bonnie Chairlie's noo awa', Safely ower the friendly main; Mony a heart will break in twa', Should he ne'er come back again. Will ye no come back again? Will ye no come back again? Better lo'ed ye canna be, Will ye no come back again? On the way back to the Glenview Inn, we had one more unexpected and fun experience. While on the one-track road, we came upon a farmer in his truck, herding – with the help of two border collies – his flock of sheep right down the road. He motioned us right on through, so we slowly drove around him, nudging sheep gently out of our way until we were completely surrounded by the bleating little creatures. There are far more sheep than people on Skye! We see them everywhere. It wasn’t raining when we woke, although it remained cloudy and gloomy. The “Misty Isle” was certainly living up to her name! We left Glenview Inn early and made such good time that we caught the 9:15 ferry in Armadale, rather than the 10:35 one we’d been aiming for. 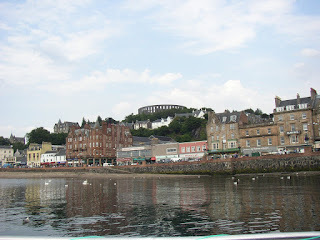 It was just a short ferry ride to Mallaig on the mainland, then we were on our way south to our next destination, Oban. 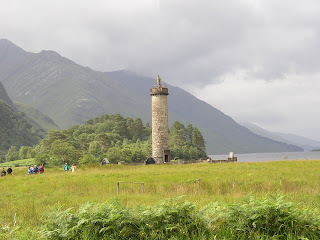 The first stop was at Glenfinnan where we saw the monument erected to commemorate the place where Charlie first raised his banner and called the Highlanders to join him. 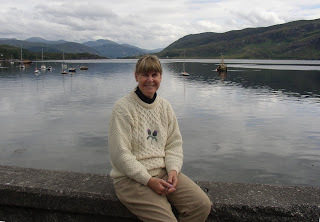 At Glenfinnan, at the loch-side shore. The royal standard soon was raised. The chieftans’ hearts to join the fray. O, Scotia, the lion’s roar! Hear the cry of the Highland men. To the sound o’ the pipes in the glen! 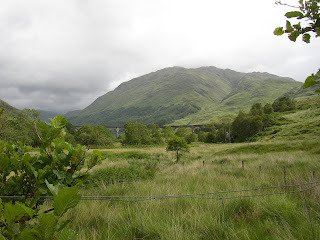 Just across the fields from the monument was the Glenfinnan Viaduct – the lovely arched stretch of railway track that was used as the railway to Hogwarts in the Harry Potter movies. We made a stop in Fort William for lunch and a little window browsing, then continued on to Glencoe, where we visited the museum then looked out over the beautiful glen where the terrible massacre of Glencoe took place in 1692. How sad – and bloody – so much of Scottish history has been! The scenery along the entire drive to Oban was really gorgeous. 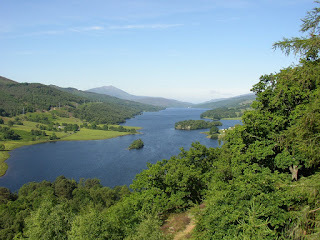 We were driving near the “bonnie bonnie banks of Loch Lomond,” where Rob Roy used to roam. Even the overcast skies couldn’t hide the beauty…although it must be really spectacular in the sunshine! 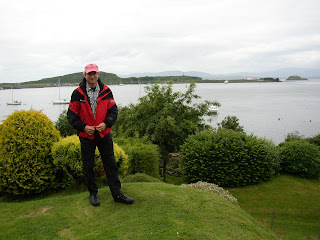 Just before we arrived in Oban, Rob pointed out the great view of Castle Stalker, the other castle whose painting is hung in our living room. 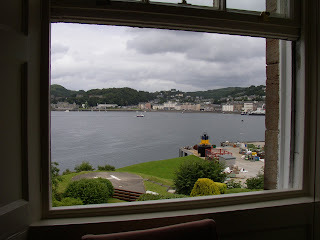 We drove into Oban at about 2:00 and drove through the very crowded little town to find our hotel, the Manor House, which actually had served as the manor house for the Duke of Argylle at one time. 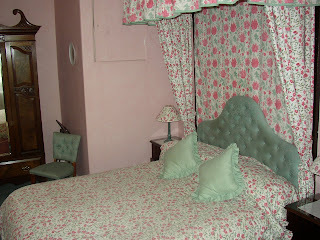 Our room was beautiful - the nicest Bed and Breakfast we stayed in on this entire trip! It reminded us a bit of our stay at La Tonarella in Sorrento. Just as in Sorrento, we walk down a little hill along the bay into town, and – just as there – our windows here look out upon a beautiful view of the bay, the town, and several islands laid out at our feet. 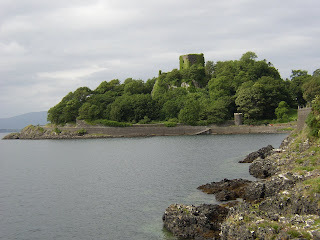 After a brief rest, we strolled around the town, walking along the waterfront and past the youth hostel where Rob had stayed about six year ago, then sitting in a little park at the base of the moss covered ruins of Castle Dunollie and watching the ferries come in and out. And we finally had a break in the weather again, with a bit of blue peering out from between the clouds. Then we walked up the steep hill behind the town to the McCraig Tower, a large colosseum-like structure from which we had wonderful views of entire bay. The Manor House sat on the water over to our left. 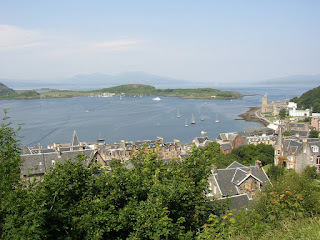 The old city, two to three blocks of old brown stone buildings, was laid out in an arc around the harbor at our feet, with the newer residential areas built off to the sides behind the small hills - and the Isle of Mull could be seen out on the horizon. The story of McCaig Tower was rather interesting. McCaig had been a wealthy Oban citizen and he developed a plan to build this big structure in order to provide employment for the working folk of Oban during the off'season when they couldn't fish or farm...and of course, it didn't hurt his feelings that he'd end up with a grand monument to himself and his family, as well! Dinner was at a great little vegetarian restaurant, the Café na Lusan, that we found tucked away on a side street, then we returned home and watched the light finally fade over the islands at around 11:30 p.m. When the sun has gone to rest, that's the time that we love best. Oh, it's lovely roamin' in the gloamin'. We woke up this morning to a glorious morning – gorgeous views of the bay, green hills and the sound of church bells ringing – and the first good weather in days. 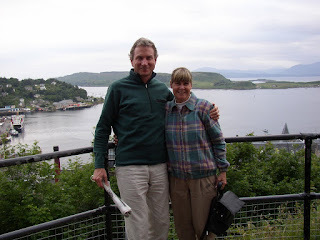 We had a delicious breakfast – a mound of scrambled eggs covered by a blanket of smoked salmon, and fresh fruit salad – in the Manor House restaurant, then went into town for a little walk along the waterfront before setting off for our ferry trip to the Isle of Mull. 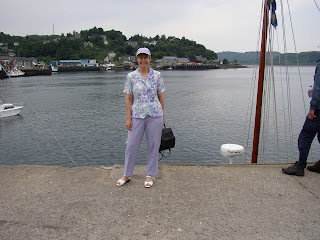 I was surprised to see the Oban Harbour filled with swans - I had always associated them with fresh water, but they seemed to like the bay just fine! We got on the morning ferry to Mull and sat on the observation deck watching the little islands that dot the loch pass byIt only took about 45 minutes to get to the little dock at Craigsmure. 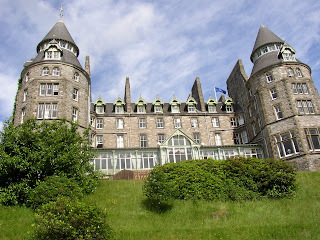 We arrived at Torosay to discover that it was NOT the castle we had spotted out on the promontory. 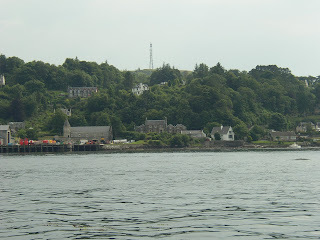 We were still separated from Castle Duarte, seat of the MacLean clan, by a large expanse of bay which was exposed by the low tide, but was boggy and impassable, so we just enjoyed a snack and a rest on the lawn at Torosay, then returned to catch the ferry back to Oban. The wind had come up a bit, so we stayed in the large cabin in large comfortable reclining armchairs where we both dozed a bit. 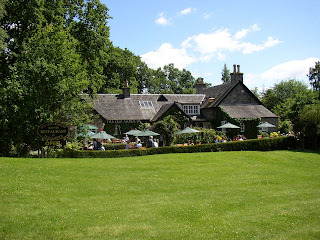 We went back to Café na Lusan for lunch then went back to the Manor House for a good nap. That afternoon and evening, we just wandered around the town. As it was Sunday, most shops were closed, but it was a nice break in our busy schedule. 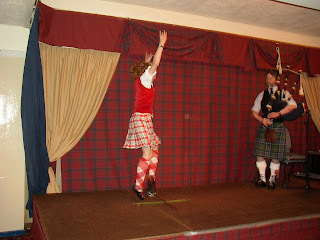 That evening, we attended the touristy, but enthusiastic, Scottish Show at MacTavish’s Restaurant. Today was just a nice lazy day. We slept in until almost 8, had another great breakfast, then just explored the town for awhile. The weather was still very good – a cloudless sky and truly warm temperatures. After a very good lunch at a seafood restaurant, Rob returned to the hotel to do some work and to wait for the AA auto repair people, as we had discovered this morning that the rental car wouldn’t start. I just browsed around the shops and did a little gift shopping…a little stuffed “Nessie” for Ruby, a Lindsay tartan umbrella and coin purse. The Lindsay tartan seems to be very popular for gift items…it is used frequently…but it is sometimes hard to match up items as the tartan comes in several variations. I also bought Rob a silly little Scottish beret with wild red hair poking out the bottom. 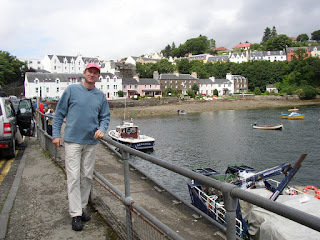 (He wants to show my parents how our trip helped him revert to his Scottish roots.) Then I spoke with a nice woman in the book shop who helped me with a Gaelic translation of “Welcome to the House of the Standing Stone” – our name for our new house. She recommended, however, that I double-check her translation with an expert. Rob and I met up again at about 3:00 and went on a fun little harbor cruise along Kerrera Island. 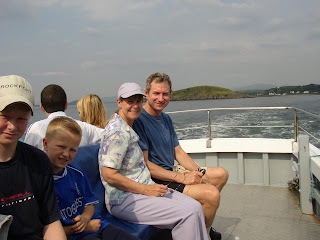 The trip was very pleasant as the weather continued to be so nice – we were warm even out on the water. 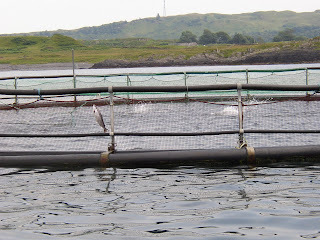 We got a great view of our Manor House from the water, and saw several very young seal pups and another area filled with salmon farms…great nets filled with salmon that were constantly leaping clear up out of the water. 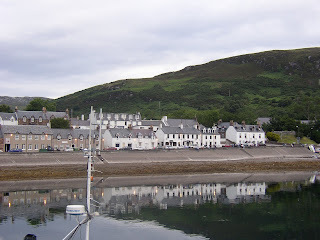 As at Ullapool, the water was filled with hundred of jellyfish – mostly small, clear moon jellies, but a few large orange ones with long trailing tentacles. I had never seen so many! After the cruise, we walked around a bit more, had dinner at another very good restaurant at the harbor, then returned for our last evening at the Manor House where we enjoyed a quiet and peaceful evening sitting on a bench in the garden looking at the islands across the bay. It was absolutely beautiful and we felt so lucky to be there! 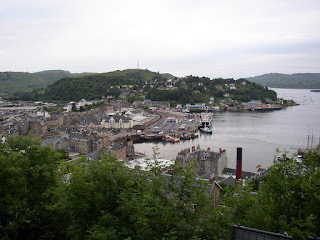 We said good-bye to Oban at around 9:00 a.m. and set off on a lovely drive across the center of Scotland. It was another beautiful day and we enjoyed the drive through green forests and glens, surrounded by large hills on all sides. 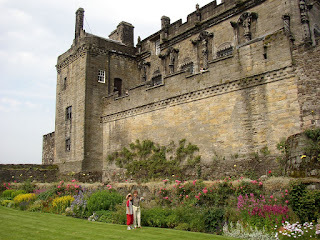 We made a stop in Stirling where we went directly to Stirling Castle. Rob, who had been there before, walked around the town while I took the tour of the castle. After all the reading I had been doing about her life, it was very exciting to see the very room where the infant Mary was crowned as queen, and the rooms where she had spent the early years of her childhood. 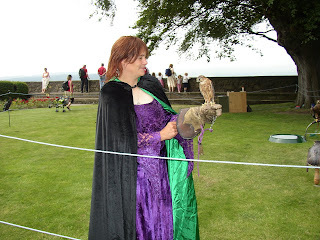 There were several special exhibits – a demonstration of falconry, a dress worn by Mary herself, and a gorgeous red and gold herald’s outfit. 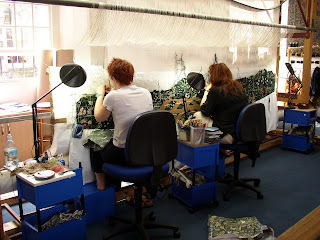 In one room, two women were weaving a modern duplicate of an ancient unicorn tapestry. It is the goal of the Castle to refurbish the Queen’s chambers exactly as they would have been in the time of Mary de Guise. Because of its location, Stirling Castle served as the home of many of the Scottish kings. It sits on a high hill with steep cliffs and can only be reached up a steep slope on one side. There are, of course, beautiful views in all directions. 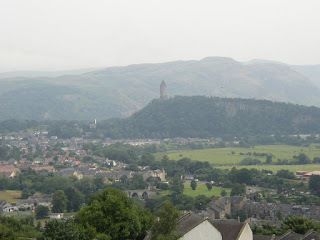 I could clearly see the Wallace Monument, a large ornate tower built in honor of William Wallace, on a lower hill across the town, and the Bannockburn battlefield in the other direction. After lunch, we faced the most difficult drive of the entire trip! 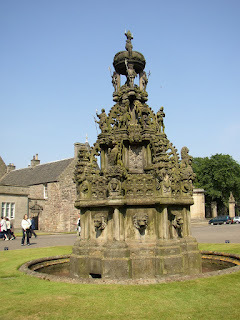 The trip from Stirling to Edinburgh returned us to “civilization” – traffic, freeways, and roundabouts with many possible exits. But Rob did a great job and made no wrong turns. But FIVE minutes before getting the car back, we had our one and only “near death” experience with the drive. The one non-negotiable roundabout rule is that the vehicles in the roundabout have the right of way. Rob entered our LAST roundabout with the intention of gently merging, but the big bus already zipping around the circle gave us no leaway and Rob avoided disaster only by slamming down his gas pedal and surging ahead at full speed. Thus it was with relief and a surge of adrenalin, that we finally arrived at the Thrifty Car Rental place. 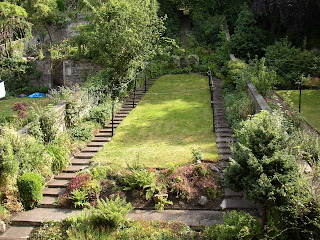 We returned the car with no problem and caught our bus to Prince’s Street where we proceeded on to the Greenside Hotel and its pretty green garden – right next door to our first hotel, the Adria. It all felt very homey and familiar – with the wonderful difference that today was beautiful weather. After a rest, we went out for a simple dinner and a stop at the Internet café. 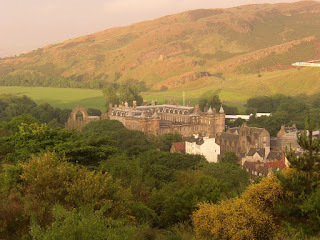 Then we walked down Canongate to Holyrood and back to the hotel. The city was gorgeous in the sunlight…it almost seemed like a different city than the one we had visited two weeks before! It was a busy day. 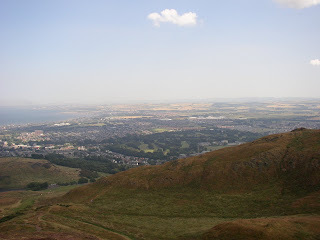 We set out right after breakfast to climb Arthur’s Seat, but the top of it was till in the mist which lay over the city, so we climbed the lower crag that sits right in front of it. We got some good views of the city, including the huge cranes being used to build the new Scottish Parliament Building, and by the time we returned to the bottom, the sun was shining in blue skies. 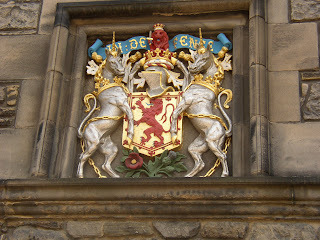 Then Rob went into town while I finally got to visit Holyrood Palace. I took the self-guided audio tour – complete with a welcome by Prince Charles and a nice musical accompaniment. It was an excellent tour. I started in the newer chambers of the palace, where the royal family stays when they visit, then through the Great Hall, then finally into the old tower where Mary Stuart had resided. 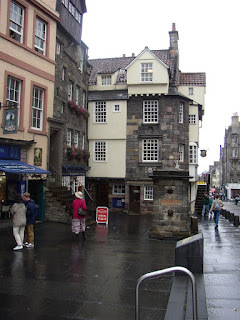 This part of the tour started downstairs in the king’s chambers where Darnley had lived, the wound up the little private staircase that connected his rooms with Mary’s…and of course, where he and his co-conspirators climbed to her room to carry out their foul murder of David Rizzio. There was the little chamber I had read about in the corner of her bedroom where Mary entertained her close friends. The bedroom itself was more woodsy than elegant, with a warm wood ceiling painted with coats of arms. Then I proceeded to the outer chamber, a much bigger room, where the bloodstains from Rizzio’s murder still color the wooden floor where he lay after being stabbed numerous times. This room was also filled with items associated with Mary, including several pieces of needlework she had completed during her many years of captivity in England. 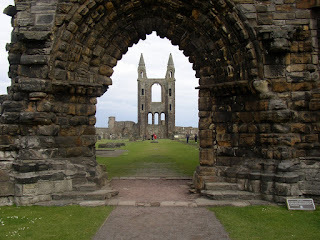 The tour ended in the ruined – but still beautiful – abbey behind the palace. Rob and I met for lunch at his favorite stuffed potato restaurant and ate our delicious meal up above the Prince Street Gardens with stunning views of the city. 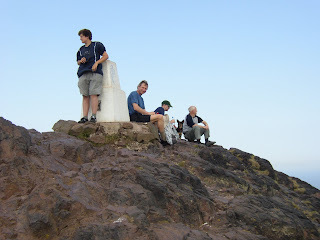 We decided to take advantage of the good weather and give Arthur’s Seat another try. It was a tough climb – quite steep, with slippery little pebbles making the path a bit treacherous. There didn’t seem to be any “official” trail…just many little trails where thousands of climbers had made their way to the top over the years. I missed the main route somehow toward the very top and found myself scrambling up a very steep cliff face. I moved very carefully and finally caught up with Rob who was waiting at the top – but it gave me nightmares that night! The climb was definitely worth the trouble! A 360o view of Scotland for miles. There was a bit of haze in the air, so we couldn’t actually see all the way to the Highlands, but we could see all the way across the Firth of Forth to the tip of Fife. The trip down was much quicker and we returned, pretty exhausted, to our hotel to clean up before going to dinner. We awoke to a heavy mist that quickly turned to a drizzle that lasted all day…so glad we did our hiking yesterday! After breakfast, we stopped by the Internet café to check our email, then returned to the National Museum which we had not had a chance to see because of the Queen’s visit during our first stay. It was a very good museum with a heavy emphasis on natural history – a huge collection of mounted animals and birds and hundreds of bugs. But it also contained an impressive collection of pottery, glassware, and Egyptian artifacts. We had lunch at Spoons, a nice little café, then separated again for the afternoon. I spent the rest of the day exploring the upper regions of High Street. I visited the Camera Obscura, which was completely obscured by the heavy mist, although the rest of the exhibit of visual effects was very interesting. Then I went to the Tartan Mill, which was a very interesting look at how the various tartans are woven. I did a bit of shopping there – got a scarf for myself and a tie for Rob in the ancient Lindsay pattern because I like the colors of it so well – then I got a pair of woolen slacks in the modern Lindsay, along with a frilly blouse and a velveteen vest to wear with my Lindsay skirt. I also bought a big woolen Lindsay shawl, which was a great help in the rain. Rob and I met at the Internet café at 5:00 and went to dinner at a very good Chinese buffet then returned to our room to start packing. We had just one more day. Our last full day in Scotland. 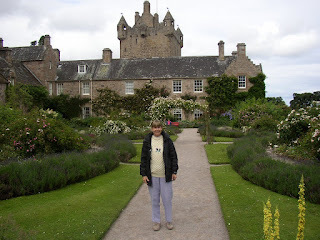 I really wasn’t quite ready to leave, still having a number of places on my “to see” list: Dynamic Earth, the National Portrait Gallery, Scone Palace, Glasgow, and the entire Grampian region, including Edzell Castle, the seat of the Lindsay clan. Well, all of that just gives us an excuse to return to Scotland some day! We awoke to another very overcast, grey day, but at least the “mizzle” had stopped. Rob and I had our last hotel breakfast together, then I set off on my own for a day trip to the “rolling hills of the Border”, while he enjoyed a relaxing day in the city. My Grey Line tour bus picked me up right at the hotel. 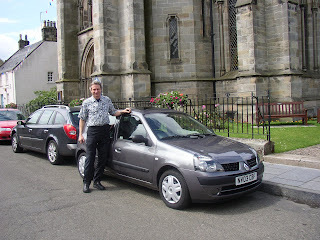 We drove south from Edinburgh and stopped first at the pretty little town of Peebles, which was once used as a hunting ground by the kings of Scotland. 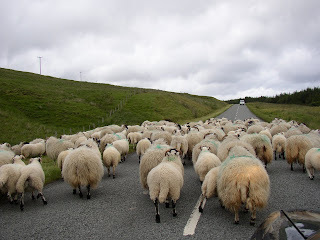 I learned along the way that Scotland has a population of 5 million people and 15 million sheep – easy to believe after all the sheep we saw on this trip! The driver also mentioned that King David I brought many of his allies and friends over from France – including the Douglases and the Kerrs! I chose Abbotsford, and I’m so glad I did! It is beautiful…like a small castle on huge, green grounds above the Tweed River. Scott had filled his home with interesting artifacts, including the pistol, sword, and dirk of Rob Roy, some letters written by Flory MacDonald (as she signed herself), and the huge keys that young Douglas had stolen and used to free Mary Stuart from Loch Leven Castle, which we had driven past on our first day out of Edinburgh. While at Abbotsford, it began to pour rain again, but I had my new Lindsay tartan umbrella, so it was no problem. The it was on to Jedburgh, where we had lunch. 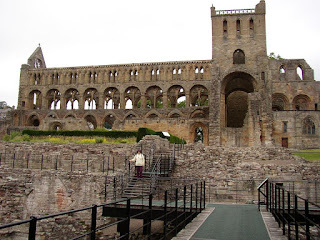 I visited the house where Mary lay close to death following her famous 40 mile ride to visit the injured Bothwell, and then visited the beautiful huge ruins of Jedburgh Abbey. It was very exciting to be visiting so many spots I had just read about in the book about Mary that accompanied me on this trip! Happily, the rain let up fairly quickly, so we finished our tour by driving up to Scott’s View, a gorgeous vista from a high hill overlooking the Tweed River and the border countryside. It was easy to see why Walter Scott loved it here. The story says that his horse, while leading his funeral procession, stopped here out of habit and refused to move for half an hour. 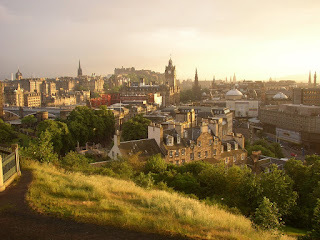 I returned to Edinburgh to meet up with Rob – and the sun graced our last evening by breaking through the clouds at last and giving us more gorgeous views of the city. Honestly, in this sunlight, I think Edinburgh is one of the most spectacular cities on earth – the sight of High Street and the Castle from across the way in Prince Street Gardens can’t be matched anywhere. 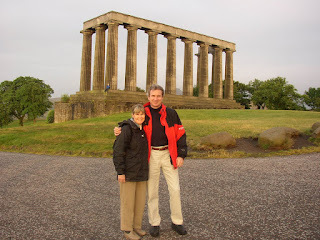 After a very good dinner at, appropriately, the Abbotsford Restaurant, we walked up to Calton Hill for our last look around – the clearest, most beautiful views yet – then returned to the hotel for an early bedtime in preparation for our very early departure. 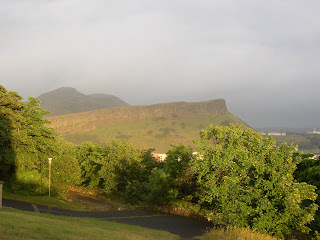 We were up at 3:15 a.m. Edinburgh, stumbling through the already dawning light to meet our bus to the airport…then on to home…filled with happy memories of a wonderful trip. Scotland was gorgeous, the people were friendly, the history was amazing. Another dream come true!